Each fall, Ward’s editors gather to evaluate the latest powertrains from the world’s automakers to determine which engines deliver the best blend of performance, value, fuel efficiency and refinement. They put the engines through rigorous testing and just a few make the final cut to win the highly coveted trophy. Ford has won eight 10 Best Engines awards in the last five years, which is more than any other domestic automaker, and the Dearborn, Mich. automaker is tied with BMW for the most wins. This year, Ford wins two 10 Best Engines awards with the 2013 Shelby GT500 V8 and the 2.0-liter fuel-efficient EcoBoost engine. Both engines are very different in power output, but similar in their efficient design. The 662-horsepower 5.8-liter V8 that powers the 2013 Shelby GT500 is the world’s most powerful production V8 engine. The 5.8-liter V8 impressed Ward’s staff as it produces an incredible 662 horsepower, but it’s also highly efficient. The Shelby GT500 is not subject to a gas guzzler tax, and is rated at 15 mpg city and 24 mpg highway. The 2.0-liter turbocharged, direct-injected engine is Ford’s global workhorse and is produced in Valencia, Spain. The four-cylinder EcoBoost powerplant has won numerous awards the past year and powers everything from the rear-wheel-drive Falcon sedan in Australia to vans in Europe and the high-performance Focus ST. Last year, the 2.0-liter won a 10 Best Engines award in the Ford Edge crossover. The 2.0-liter turbocharged EcoBoost is an impressive engine and can deliver both fuel-efficiency and performance. In the new 2013 Focus ST, the 2.0-liter pumps out 252 horsepower and 270 lb.-ft. of torque. The Focus ST is capable of 154 mph and will launch from 0-62 mph in 6.5 seconds. Ford’s first global performance car comes with the latest direct-injection that also is highly fuel-efficient. The performance compact gets 39 mpg in Europe and delivers CO2 emissions of 169g/km. Both the 2013 Shelby GT500 V8 and 2.0-liter turbocharged EcoBoost engines are winners in their design and performance. 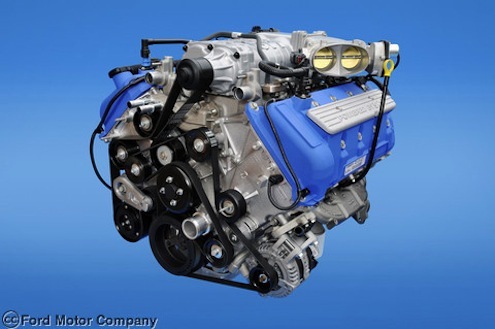 Ford engineers are developing some of the best engines on the planet.